No need to specify fixture names in tests signatures. (No changes to tests required). Accessing fixtures as instance attributes. (No changes to tests required). The main feature used to solve this issue is autouse fixtures. The detailed explanation is available in official documentation, but shortly: it allows to execute fixture before each test or test method in the current case. The first approach uses a new decorator for test classes. This decorator injects an autouse fixture in the decorated class; this fixture will then be called automatically before each test. Thanks to Bruno Oliveira(nicoddemus) for the help with creation this solution. As it was demonstrated fixtures names passed to the decorator are now available to test methods as instance attributes. Consider the scenario where user has more then 5 or 10 classes and they all inherited from a main TestBase class? The answer is to take the first approach and modify it to do all hard work with decorators automatically. First put the autouse fixture in the TestBase class, which will make it available to all child classes automatically. A second step is to declare a list of fixtures that will be injected in each test class. In the ideal world they will be the same for all classes and tests, but in reality it will be different for each class. Define a tuple fixture_names in each test class with the names of the fixtures that should be injected for each test. The example below demostrates ideas mentioned before. Important to mention that the approach above also work for pytest-style classes (subclassing only object). Last example can be improved for scenario tests. However the guide mentioned in the official documentation is not compatible with unittests subclasses. There is a way to pass fixtures from python code to tests via plugins argument of pytest.main(). To pass something to pytest-executed tests we can use plugin mechanism of pytest. (For not let says that myplugin contains actual plugin, I’ll show later how to create it). Create class or other dotted object (object with members accessible by dot: plugin.something). This way I found more preferable, because I have higher degree of freedom during class initialization. I can put all information I want inside class in very natural way. pytest comes with a handful of powerful tools to generate parameters for a test, so you can run various scenarios against the same test implementation. All of the above have their individual strengths and weaknessses. In this post I'd like to cover ids for tests and why I think it's a good idea to use them. Please check out older posts on this blog to find out more about parametrization in pytest, if you haven't already. To understand how pytest generates ids for tests, we first need to know what test items are. For pytest a test item is a single test, defined by an underlying test function along with the setup and teardown code for the fixtures it uses. Essentially, everything we need to run a test. Suffice to say that this is a slightly simplified explanation, but that's all we need to know for now. There is a single test function in above code example. It calls a function called fizzbuzz with an integer and checks that its return value matches a certain string. Now when we run this, pytest creates a number of test items under the hood. This is exactly what we can see in the test result log when running pytest in normal mode (not quiet or verbose). Now pytest lets us add ids to test items to make them easier to distinguish in the log, especially in verbose mode. If you leave it up to pytest to generate ids, you will see that most of them are pretty good, but others feel somewhat random. The reason being that non-primitive types such as dict, list, tuple or instances of classes are non trivial to translate into ids. The following test is parametrized and the id for a test item will be a representation for each individual parameter - joined with a -. As you can see whenever pytest encounters one of the non-primitives it uses the parametrized argument name with a suffix instead. The good news is that you can define ids yourself rather than leaving it up to pytest to somehow figure them out. Note that passing a list of str values to the ids keyword overwrites ids per parameter combination in a marker and not for individual parameters. See how there is no - in the logged ids? "Hey, you've talked about tests, items, ids, and now markers?!" I know...it can be confusing. I hope to make this as clear as possible as we go on. Hopefully in the end of this post, when reading the TL;DR, you know how ids work and how you can use them to make your test suite more maintainable. As I've mentioned earlier str id values are applied to a specific parameter combination of markers rather than test items or individual parameters. To illustrate this, let's have a look at the following code example. Above is the same test from the previous section, but uses an additional test parameter c, which is set up with another parametrize marker. As you can see here from the printed ids, for instance [int-bool and str], a string value is taken from each marker and joined with - as it would for the automatically generated ids. Instead of providing str values for test items, you can also pass in a function or method, that will be called for every single parameter and is expected to return a str id. Unlike str ids the function is called for every parameter! If your callable returns None pytest falls back to the autogenerated id for that particular parameter. A new hook called pytest_make_parametrize_id was added in pytest 3.0 that makes it easy to centralize id generation. One of the reasons why you might want to do this, is when you use instances of your custom classes for parametrized tests. I personally don't think it's a good idea to change the classes, by modifying the __repr__ or __str__ magic methods, just so that you get this extra convenience in your tests. Instead I would encourage you to try out this hook. The test and the markers are identical to the example from the previous section, except for the ids keyword argument in the markers. val is the value that will be passed into the test a particular parameter and config is the test run config, so you could check for command-line flags etc. if you want to. We effectively moved the implementation of our id_func to this hook, which means we don't need to set ids in all of the @pytest.mark.parametrize as long as we are happy with the way it generates ids. We can still overwrite them by explictly by setting a str id or passing in a callable. Ids for fixtures are in fact easier to understand as for parametrize markers, as they don't have any edge cases that you need to be aware of. Fixtures always return a single value, which means regardless of whether you use str ids, an id callable or the pytest_make_parametrize_id it will always be applied to this very parameter that the fixture returns. So the only thing to keep in mind really is that str ids for pytest.mark.parametrize. 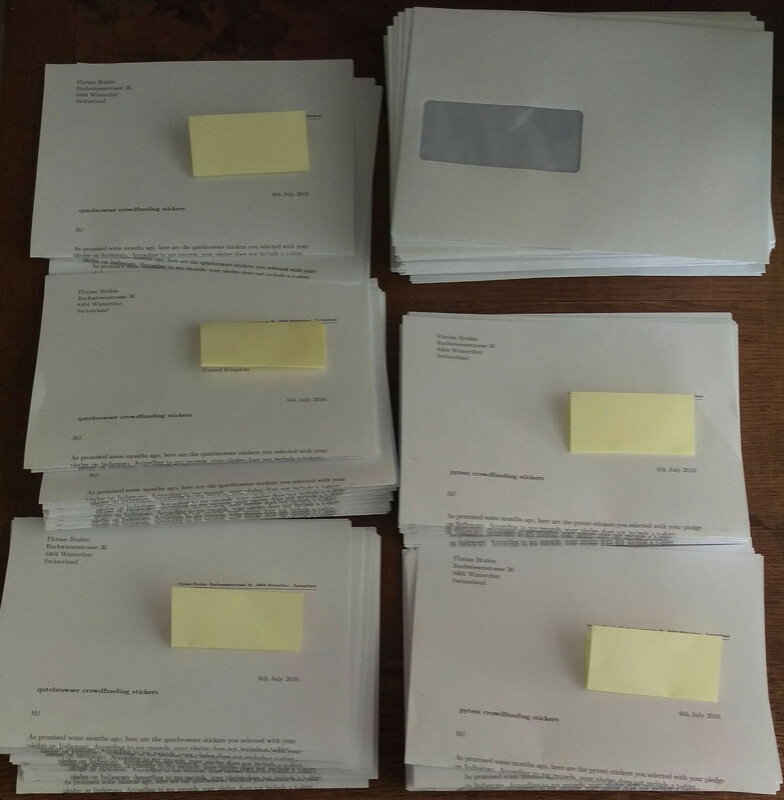 Last Thursday, I sent out 68 letters to 19 countries, containing the stickers for the pytest and qutebrowser crowdfundings! 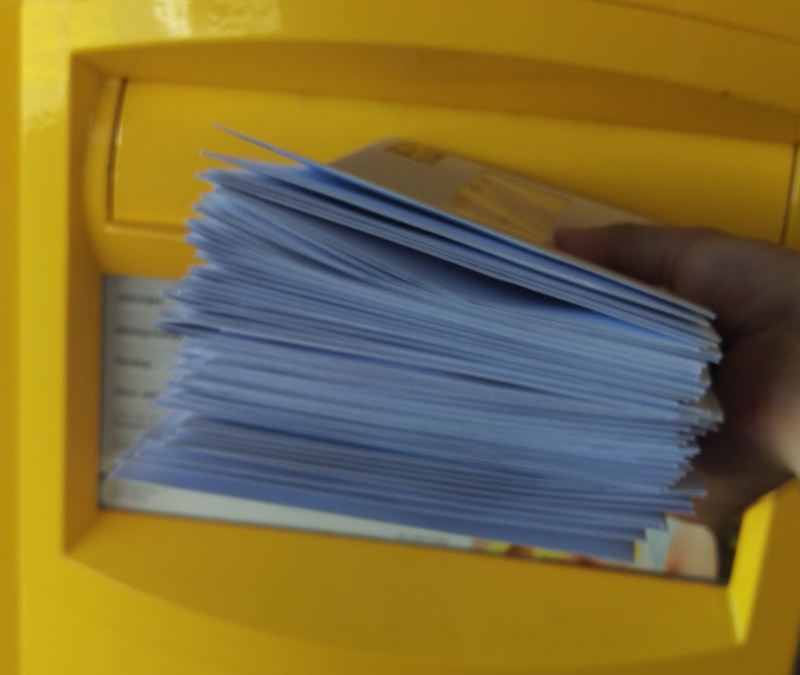 Turns out addressing international mail correctly gets really hard when you have the address as individual parts rather than a free text field! I special-cased the UK and US to (hopefully) match their format, and hoped everyone else used something like "1234 City"... See the script source for details if you're curious. To make things worse, on most of the letters I had to stick two stamps. At least they were self-adhesive! If your pledge level also includes a t-shirt, I'll send your stickers together with the t-shirt, which unfortunately still will take a while to arrive. Stay tuned! Not too much exciting stuff this time - I mostly continued working on getting basic stuff like scrolling and zooming to work after the refactoring, and added a temporary fix for :navigate and hinting until I get to rewriting them for QtWebEngine. 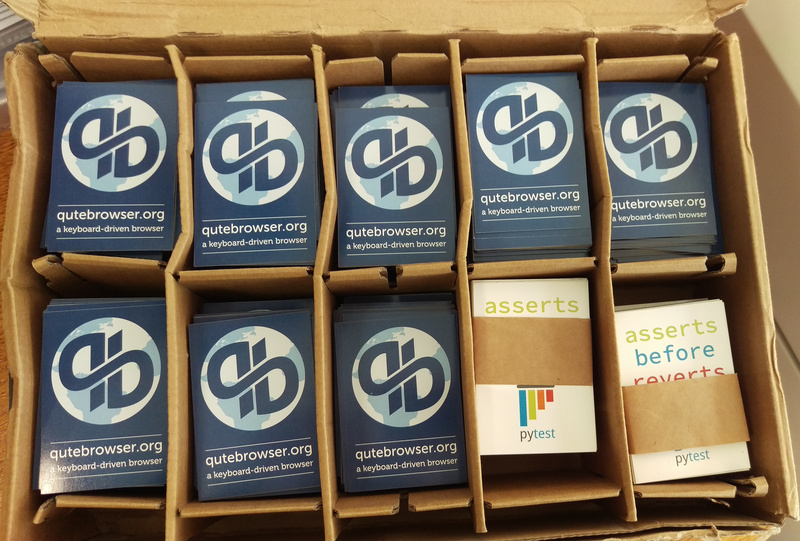 For the rest of this month, I won't be working on qutebrowser much, as I'll be at the pytest sprint in Freiburg. However, I plan to work on various things I need in qutebrowser's testsuite too! 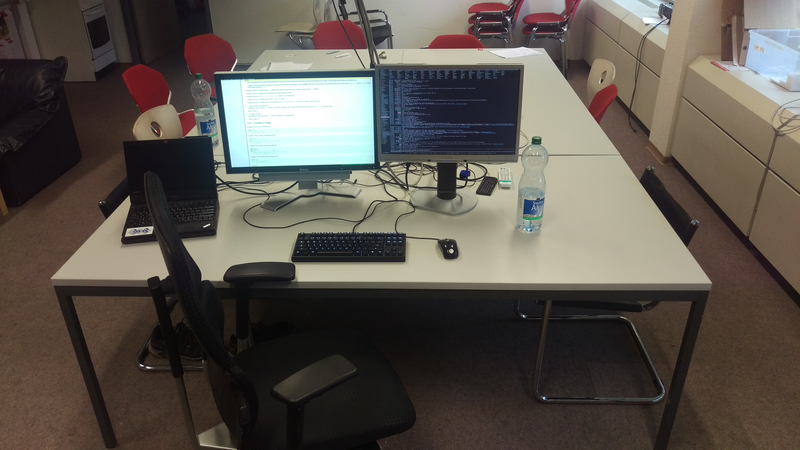 After the sprint, 27th to 29th, I'll host a professional training for pytest, tox and devpi in Freiburg. If you'd like to join as well, there are still free spaces! Everything started nicely: Someone posted a pull request to handle links with (non-standard) spaces correctly with hints (<a href=" http://example.com ">), I told them how to add a test, they did, I fixed a small issue, bam, merged. Then I fixed some tests which were failing due to changes from yesterday. The first one was a test which failed reliably on Windows since changing the test to use a real file instead of a mock. After printing the raw values staring at them for some seconds, I figured the few missing bytes were exactly the count of \r (carriage returns) you'd need to insert. While Python takes care of the conversion when reading/writing files, when getting the last 64 bytes of a file, you'll get less data on Windows. With that out of the way, I looked at the other test which was flaky - it reads the history a qutebrowser subprocess, definitely waits until the subprocess has written it, and still sometimes ends up with an empty file. I let the logs sink in for a bit, but I still have no idea what'd cause it. In the end I just ended up marking the test as flaky using pytest-rerunfailures. This means it'll be run a second time if it fails, and if it passes then, it's assumed to be okay. This is definitely less than ideal, but it's better than having a test which fails sometimes for no apparent reason, and better than not testing this functionality at all. After all that, I updated to Qt 5.6.1 to check if a segfault on exit was fixed like claimed in the bug report. Turns out it wasn't, but instead there was a new bogus warning and a weird behavior change I needed to take care of in my testsuite. Now I hoped I was finally done fixing weird bugs - turns out that was just the beginning. Someone joined the IRC channel and reported how hints often don't work at all for them since the big hint changes from Monday. I couldn't reproduce the issue, and what we were seeing made no sense at all. See the bug report I opened to see all the gory details. If I tried to write them up here, I'd probably just hopelessly confuse myself again. They are an experienced Python programmer as well, and after over 3.5h of debugging, we gave up. I ended up adding a setting which allows to revert back to the old Python implementation. It's less accurate but also faster than the new (JS) one, so some people might prefer that anyways. I improved the error message when an invalid link is clicked as I stumbled upon it and it confused me. I also started refactoring the history implementation and adding a few tests to it, as I still need to do a small change to handle redirects nicely before releasing v0.7.0 (what is what I originally planned to do today...). The refactoring also allowed me to split off the QtWebKit-specific part of it nicely, so that's already a little step closer to QtWebEngine as a nice side effect! I really want to release v0.7.0 tomorrow unless another serious regression is found (fingers crossed!). And then full-speed towards QtWebEngine support next week! Yesterday evening, a contributor had a nice idea of a better output for BDD style tests when they fail. BDD tests work by spawning a local webserver, spawning a qutebrowser process, sending commands to it, and parsing its log. """Add a BDD section to the test output.""" Today I was mostly busy with merging a half-year old pull request with various hint improvements which was missing tests, and the author of it didn't have the time to add them currently. 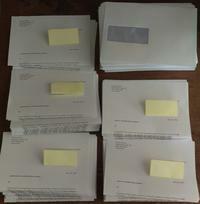 To make things easier, I reviewed and cherry-picked the individual commits one by one, and then added tests for them. See the resulting merge if you're curious. New hints -> auto-follow-timeout setting to ignore keypresses after following a hint when filtering in number mode. Number hints are now kept filtered after following a hint in rapid mode. Currently it's looking like I have three pull requests left to merge tomorrow, one of them being a trivial doc update about Debian packages which is ready to merge, but I'll merge it shortly before the release. In Create Tests via Parametrization we've learned how to use @pytest.mark.parametrize to generate a number of test cases for one test implementation. You can pass a keyword argument named indirect to parametrize to change how its parameters are being passed to the underlying test function. It accepts either a boolean value or a list of strings that refer to pytest.fixure functions. If you set indirect to False or omit the parameter altogether, pytest will treat the given parameters as is w/o any specialties. All of the parameters are stored on the special request fixture. Other fixtures can then access it via request.param and modify the test parameter. You can choose to only set indirect for a subset of arguments, by passing a list to the keyword argument: indirect=['foo', 'bar']. We define two classes that have a few fields to hold information. The tests will access the attributes to check for correctness of our code. For that we create a number of instances of the Sushi class with varying parameters, before we call its property is_vegetarian in the test to see if the Fooshi Bar offers a few vegetarian dishes. A fixture named fooshi_bar creates a Restaurant with a variety of dishes on the menu. The fixture sushi creates instances based on a name and looking up ingredients from the session scoped recipes fixture when the test is being run. Since it is created with params it will not only yield one but many instances. pytest will then create a number of test items for each of the test function that uses it. """Returns a Restaurant instance with a great menu.""" """Return a map from types of sushi to ingredients.""" """Create a Sushi instance based on recipes.""" We define two test functions that both use the sushi fixture. test_fooshi_serves_vegetarian_sushi also uses fooshi_bar as well as side_dish, which is dynamically created during collection phase via mark.parametrize. Note how sushi is created with indirect=True. Unlike side_dish it will be passed on to the according fixture function which turns the name of a type of sushi to an actual instance as explained above. When running these tests we can see that test_sushi is run eight times as expected as its only fixture sushi is created with eight parameters. On the other hand test_fooshi_serves_vegetarian_sushi is run six times combining one value for fooshi_bar, two values for side_dish and three values for sushi! Since test parametrization is performed at collection time, you might want to set up expensive resources only when the tests that use it are being run. For more information see the parametrize pytest docs. as the recommended command line entry point for pytest. Don’t worry – the old entry point will still work when 3.0 is released, but we should be able to skip a bunch of confusion for new users! 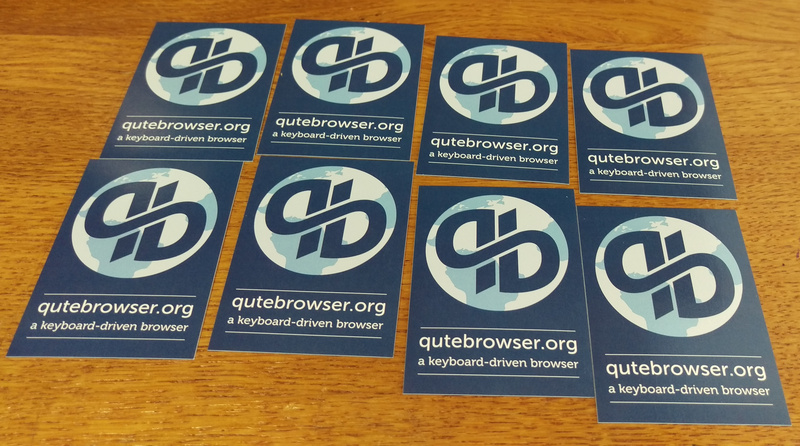 A bit over two months ago, I started a crowdfunding campaign for qutebrowser, with the goal of working full-time on adding QtWebEngine support to it, which will bring more stability, security and features. I asked for 3000€ to fund a month of full-time work before starting my studies in September. The campaign took off more than I'd have ever imagined and was almost funded in the first 24h. At the end of the campaign, I got two months of full-time work funded. I'm now close to starting those awesome two months and set up this blog as a work log for what I'm doing, inspired by the one of git annex assistant. I also submitted this blog to planet python, planet pytest and planet Qt - if you're reading this via one of those, fear not: I have dedicated tags for them, and only will tag posts which actually seem relevant, so you won't see daily posts there. My full-time work is planned to start tomorrow. I have some other obligations until September, so there will be some days in between where I won't be working on qutebrowser, but other things related to either Python or my studies. June 16th - 29th I'll be in Freiburg for the development sprint on pytest (which qutebrowser is using too), and giving a 3-day training for it. July 17th - 24th I'll be in Bilbao at EuroPython giving another training about pytest and hopefully learning a lot in all the awesome talks. August 12th I'll be travelling to Cologne for Evoke, a demoparty I'm visiting every year (let me point out this has nothing to do with political demos, go check the wikipedia article :P). August 22th - September 2nd I'll be busy with a math preparation course of the university I'll be going to. Preparation: Writing end-to-end tests for all important features, merging some pull requests which are still open, doing a last release without any QtWebEngine support at all, and organizing/shipping t-shirts/stickers for the crowdfunding. A lot of this already happened over the past few months, but I still expect this to take the first few days. Refactoring: Since I plan to keep QtWebKit support for now, I'll refactor the current code so there's a clear abstraction layer over all backend-specific code. This will also make it easier to add support for a new backend (say, Servo) in the future. Since this will probably break a lot in the initial phase, this work will happen in a separate branch. As soon as the current QtWebKit backend works fine again, that'll be merged and QtWebEngine support will be in the main branch behind a feature switch. Basic browsing: The next step is to get basic browsing with --backend webengine working. This means you'll already be able to surf, but things like adblocking, settings, automatic insert mode, downloads or hints will show an error or simply not work yet. Everything else: All current features which are implementable with QtWebEngine will work, others will be clearly disabled (a few obscure settings might be missing with --backend webengine for example). See the respective issue for a breakdown of features which will probably require some extra work. This depends on what features you need, and how fast I'll get them to work. Estimating how long the steps outlined above will take is quite difficult, but I hope you'll have something to try after the first week or so. Also note you'll need to have a quite recent Qt (5.6, maybe even 5.7 which isn't released yet) at least at the beginning, because QtWebEngine is missing some important features in older versions. It certainly wasn't when it was first released with Qt 5.4 in December 2014. That's also why I spent a lot of time writing tests for existing features instead of trying to start working on QtWebEngine support. Long story short: It's by no means a drop-in replacement (like initially claimed by Qt) - but most users won't notice any missing functionality which I can't implement at all with a recent enough QtWebEngine, and things are getting better and better. Using spacemacs, writing ReStructuredText, storing it in a git repo, processing it with Pelican, the Monospace theme and the thumbnailer plugin. By default py.test collects all classes which start with Test that are found in test*.py or *test.py modules. This behavior can be configured using the python_classes and python_files configuration options. Also, it will out-of-the box collect classes which subclass unittest.TestCase (regardless of their name), making it easy to run existing test suites. But thanks to py.test's flexible plugin architecture, one can customize how tests are collected from classes to suit almost any requirement. Recently someone asked in the pytest-dev mailing list how to make py.test collect all classes, that subclass from some specific base class, independently of their name. You can implement your own collection rules by implementing the pytest_pycollect_makeitem hook. This won't interfere with the normal test collection mechanism, only add to it, so classes prefixed with Test will also be collected as usual. If you are migrating from unittest to pytest, you might encounter warnings when running your tests. No failures, no errors, but pytest-warnings. This may be confusing to you, regardless of whether you are new to pytest or an experienced user. In the following example, pytest displays pytest-warnings at the very end of the test run in the session summary. Running the same tests under unittest does not show any warnings. As you can see there are two tests that are collected and both pass without any failures or errors. At first glance, the implementation may look just fine (albeit admittedly not particularly meaningful). It implements a stub client that inherits from a real client and returns a TestResponse instance as opposed to sending a request over a network connection. Then there are two unittest tests, one for a valid url and another one for an invalid url respectively. Pytest is perfectly fine with it being unittest.TestCase methods, so that is unlikely to cause the issue. Running the suite with this flag now points us to the source of the problem. Pytest tries to collect TestResponse as its name matches the naming conventions for test classes. However it finds a __init__ method, which it cannot understand. In this particular case, there is an simple solution to what one could consider a code smell: Rename the classes which are used in your tests but not actual test cases. Have you ever heard of pdb - the Python Debugger? I strongly recommend checking it out, if you haven't used it yet. The standard library's built-in debugger will prove useful for debugging your Python code without installing any external dependencies or setting up some fancy IDE. If invoked with the --pdb option, pytest will place a debugger breakpoint whenever an error occurs in your tests. You can also set a debugger breakpoint yourself with import pdb; pdb.set_trace(). Use commands help, list and pp to inspect the test code. If you want to get a list of all local variables and their value, it's best to run pytest with the -l option enabled, as locals() may contain internal pytest items if you print it from the breakpoint. An underrated feature of pytest is the --lf option, which tells pytest to only run the tests that failed the last time it was executed. Once you've encountered any errors in your tests, you want to focus on the failures and get a better understanding of what's causing the problems as opposed to spending time on running tests that are perfectly fine. Keep in mind though, whenever you modify your code other tests may break. If you run $ py.test --ff all tests will be executed, but re-ordered based on whether they've failed in the previous run or not. Failures first, successful tests after. You can end the test session early by pressing CTRL-C. Although pytest catches the KeyboardInterrupt error and runs the teardown code before closing the session gracefully, it is definitely not the best way to stop the test suite. Instead use -x to stop after the first failure, or --maxfail=N to stop after the first N failures. Imagine you want to write a test for a particular function, but for multiple input values. Writing a for-loop is a bad idea as the test will fail as soon as it hits the first AssertionError. Subsequent input values will not be tested and you have no idea which part of your code is actually broken. At the same time you want to stick to DRY and not implement the same unittest.Testcase method over and over again with slightly different input values. To parametrize a fixture you need pass an interable to the params keyword argument. The built-in fixture request knows about the current parameter and if you don't want to do anything fancy, you can pass it right to the test via the return statement. Sometimes you may find yourself struggling to chose which is the best way to parametrize your tests. At the end of the day it really depends on what you want to test. But... Good news! Pytest lets you combine both methods to get the most out of both worlds. With only two few lines of pytest code, we can create loads of different scenarios that we would like to test. By re-using parametrized fixtures and applying the aforementioned markers to your tests, you can focus on the actual test implementation, as opposed to writing the same boilerplate code for each of the methods that you would have to write with unittest.TestCase. If you run the tests now, you will see that pytest created 18 individual tests for us (Yes, yes indeed. 18 = 3 * 5 + 3). pytest-xdist is a plugin for distributed testing. A somewhat common need is how one can make a plugin share data between master and worker nodes? Here's a simple recipe that provides a shared_directory fixture which points to a temporary directory accessible by both masters and worker nodes. master or worker nodes in xdist runs. Anything put in node.slaveinput dictionary during the pytest_configure_node xdist hook can be accessed by the worker nodes later. You can put any simple builtin type, like lists, strings, tuples, etc. The shared_directory fixture can then be used by a plugin or even tests to have a common directory where information can be exchanged. This recipe also shows how one can find out if the code is running in the master or a worker node.